With the NFL now just a month away, the talk is heating up about who the Cleveland Browns will select – especially in the first round. Many expect the Browns to select from the group of top-ranked quarterbacks that includes (in no particular order), Blake Bortles, Derek Carr, Teddy Bridgewater, Jimmy Garropolo, Tom Savage, Keith Wenning and Johnny Manziel. And if they get it wrong? Well, the secondary market for Browns quarterbacks in the NFL has turned into an especially fruitful one. Depending on how things shake out between now and the start of the NFL season this fall, there could be as many eight former Browns quarterbacks on NFL rosters. Seriously. Brandon Weeden, who signed a two-year contract with Dallas after being released last month. 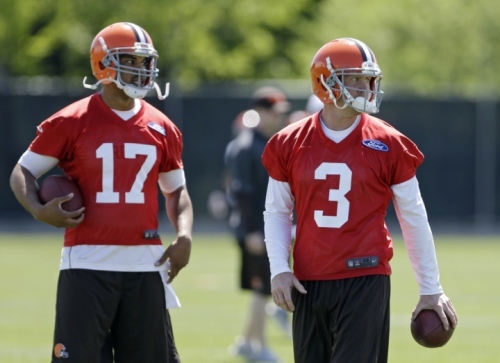 Jason Campbell, who signed a one-year deal with Cincinnati after being released last month. Colt McCoy, who last played for the Browns in 2012. He signed with Washington last week. Derek Anderson, who last played in Cleveland in 2009. He resigned with Carolina last month. Thaddeus Lewis, who started one game for the Browns in 2012, and who is currently with Buffalo. Bruce Gradkowski, last seen in the Orange and Brown in 2008, currently with Pittsburgh. Luke McCown, who made four starts (and went 0-4) for the Browns in 2004. He’s currently still kicking around in New Orleans. And if Brady Quinn, spent time with St. Louis last season before going on injured reserve and having back surgery, finds a spot that will bring the number to eight. Unbelievable. The Browns can’t find one decent starting quarterback but they can find plenty of second and third stringers. We started thinking about all of this after seeing Weeden’s recent comments about his time in Cleveland. Cleveland. Where quarterbacks bide their time until they can get a fresh start somewhere else.